Please read the following carefully before using this website. Your access and use of this website is conditioned on your acceptance of and compliance to the following Terms. These Terms apply to all visitors, users and others who access this website. By visiting Latina Wife and Mom Life, you engage in my service and accept and agree to be bound by these Terms. If you disagree with any part of the following Terms, then you may not access the website. Latina Wife and Mom Life is a personal blog written and edited by me. This blog accepts forms of cash advertising, sponsorship, paid insertions or other forms of compensation. I believe in honesty of relationship, opinion and identity. This website occasionally receives compensation, discounts and/or complimentary items or services in exchange for a review or promotion. Additionally, I occasionally use affiliate links for products that I recommend, meaning that if you purchase anything through my affiliate links, I will receive a commission. You will not pay more if you purchase through my affiliate link. I will always disclose when one of my links is an affiliate link and I only promote or endorse products or services that I honestly believe in and recommend. All reviews are based on my honest opinion. Latina Wife and Mom Life is not compensated to provide opinion on products, services, websites and various other topics. The views and opinions expressed on this blog are purely my own. I will only endorse products or services that I believe, based on my expertise, are worthy of such endorsement. Any product claim, statistic, quote or other representation about a product or service should be verified with the manufacturer or provider. Latina Wife and Mom Life is a participant in the Amazon Services LLC Associates Program, an affiliate advertising program designed to provide a means for me, the owner, to earn fees by linking to Amazon.com and affiliated sites. Content: The content shared in Latina Wife and Mom Life is my personal opinion only. I am not a professional and all information presented on this blog is for educational or informational purposes only. The information presented is from my own personal experiences and is not a guarantee or promise of specific results. You should not rely on my experiences or results and should always consult with a professional before relying on information on this blog. The ideas and experiences I share here are those that have been beneficial to me. At your discretion and better judgement, you are welcome to apply them should you find it favorable to your situation. However, any initiative you decide to take based on the content of this site is your ultimate responsibility. Latina Wife and Mom Life and associated companies shall not be liable for any direct, indirect, incidental, special or consequential damages that result from the use of, or the inability to use, the website or materials on this site. Age Restrictions: Latina Wife and Mom Life is not intended for children under 13 years of age. No one under age 13 may provide any information to or on this Site. We do not knowingly collect personal information from children under 13. If you are under 13, do not use or provide any information on this Site or on or through any of its features. Do not use any of the interactive or public comment features of this Site nor provide any information about yourself here, including your name, address, telephone number, email address, or any screen name or user name you may use. User Activity: Any user generated content on this website (i.e. through blog comments or social media posts) will be publicly available to other users. You own the rights to any content that you post on this website, but agree to give us a license so that this content can be shared on this website. I reserve the right to remove any content that I determine to be unlawful, inappropriate, offensive or otherwise objectionable or violates any party’s intellectual property or these Terms. By posting or submitting any material or information to this website, you agree to grant this site an unlimited license so that this content can be shared on Latina Wife and Mom Life. I reserve the right to terminate any users for abuse of these Terms. I reserve the right to remove unlawful, obscene, inappropriate or otherwise undesirable shares or comments on my blog or social media channels. Automated Information: Upon visiting Latina Wife and Mom Life, we receive and collect information, which may, in certain circumstances, constitute personal information such as your IP address, referral URL, exit URL, browser software, operating system, date/time and/or click stream data. The use of this information serves the following purposes: To diagnose problems with our servers, to administer this Site and services. This is not linked to any personally identifiable information, except if necessary to prevent abuse on this Site. Website Analytics Tools: We use analytics services by third parties to collect information about the use of this Site, such as number of visits, pages visited, popularity of certain content. Analytics tools use tracking technologies (like COOKIES) to recognize your device and compile information about you. They collect information such as what pages you visit and how much time you spend on these pages, the IP address assigned to you, what operating system and web browser you use, and what site you visited prior to visiting our website. The use of this information serves the following purposes: To improve services on our site, diagnose problems, administer this Site, resolve issues and optimize Site for ultimate user experience. Retention Periods: Information collected on our website will only be retained for as long as necessary to fulfill the purpose for which it was collected. Your personal data is deleted automatically by our systems in accordance with these retention periods. Please Note: Even upon considering any of the above requests, there is certain personal information that may be exempt from those requests under particular circumstances. These may include a need to keep processing information for legitimate interests or to comply with a legal obligation. If such an exception applies, you will be notified upon response to your request. Also keep in mind that you may be asked to provide the information necessary to confirm your identity before proceeding with your request. Outside Links: Latina Wife and Mom Life includes links to other websites. Once you leave my website or are redirected to a third-party website or application, you are no longer governed by the Policies or Terms and Conditions from this site. When you click on links on my website, they may direct you away from my site. I am not responsible for the privacy practices of other sites and encourage you to read their own disclosure statements. I have no control over, and assume no responsibility for, the content, privacy policies or practices of any third party websites or services. You further acknowledge and agree that I shall not be responsible or liable, directly or indirectly, for any damage or loss caused or alleged to be caused by or in connection with use of or reliance on any such content, goods or services available on or through any such websites or services. Comments: When you leave a comment on this website, you are giving implied consent for this comment and your information to appear on our website. In leaving a comment, your name and email address will not be shared with any third party. I may use your email address solely to respond to your comment. However, I am not liable or responsible for the actions of other individuals and the unauthorized use by such information that you voluntarily share. Social Media: I have public social media accounts and social sharing options on my website. If you choose to interact on social media with me or my accounts, you are advised that any interactions on those accounts are publicly available. Email Marketing: If you choose to opt in to my weekly email newsletter, you will occasionally receive emails regarding updates, promotions, gifts and overall bonus content. You may opt out at any time. My email newsletter is managed through an email list management provider and opting out of one of my email lists may not necessarily remove you from all emails. 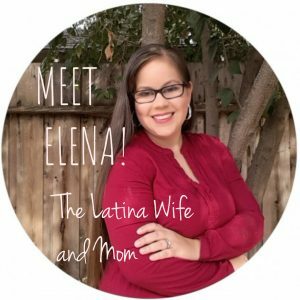 Should you have any issues or problems unsubscribing, please contact me: elena@latinawifeandmomlife.com. These Policies may change at any time with or without notice. All updates will be posted on this page, so that you are aware of what information we collect, how we use it, and under what circumstances, if any, we disclose it. The content shared in Latina Wife and Mom Life belongs to me and is protected under the United States Copyright Act. No part of my website may be reproduced, stored, or transmitted in any form or by any means, electronic, mechanical, photocopying, recording, scanning, or otherwise, except as permitted under Section 107 or 108 of the 1976 United States Copyright Act, without my prior written permission. Should you find any portion of my content worth sharing, please link back to the post of your reference. Otherwise, if you find something you deem worthy of reproduction, please contact me for expressed consent. I am not responsible for republished content from this blog on other websites without my permission via written consent.